An artist has created the world's smallest sculpture only for it to be accidentally crushed by a finger while being photographed. Jonty Hurwitz's creations are so tiny they can rest on a human hair and are the same size of an ant's head. Having spent months working on the pieces, the 45-year-old from Chichester, West Sussex, took them to a photographer to have them pictured under a microscope. But within minutes his work had been destroyed by the stroke of the lab technician's finger. The sculptures are believed to be the smallest representation of the human form ever created by man. I went off to have the original sculptures photographed so I found a laboratory with an electron microscope and the photographic technology,' said Mr Hurwitz. The sculptures are less than 1mm tall and are produced via a process called nano-painting. They are too small to be seen with the naked eye so must be viewed and photographed under a microscope. Mr Hurwitz uses a 3D printing technology to produce them. Describing the process on his website, he said: 'The structure is created using a ground-breaking new 3D printing technology and a technique called Multiphoton Lithography. 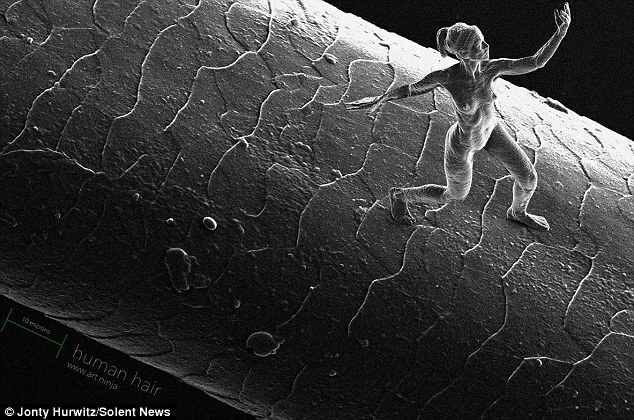 Mr Hurwitz has produced a number of nano sculptures using the same technology though the naked woman above is believed to have been the smallest. 'Ultimately these works are created using the physical phenomenon of two photon absorption. Art, literally created with Quantum Physics. This two photon absorption occurs only at the tiny focal point - basically a tiny 3D pixel (called a Voxel).